A cast iron exhaust manifold is brazed with SSF-6 Silver Solder. We cleaned a 3 to 4 inch cut, then silver soldered the cut with an oxyacetylene torch. When working on a cast iron it is important not to heat the base metal bright red and never cool down with water. Flow out each drop of rod before depositing more. To achieve the best seal, create a flat braze. Use more flux if necessary. Broad heating is important to get a ensure an even flow. High-strength, 56% silver solder alloy. 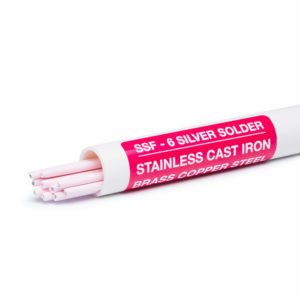 This cadmium free solder is an ideal replacement for fluxless silver solder coils.